Here are 9 developments of interest to fans. China’s most innovative ark builder, however, may be Yang Zongfu, a 32-year-old businessman in eastern China. His vessel, Atlantis, a three-ton yellow steel ball 13 feet (four meters) in diameter, is designed to survive a volcano, tsunami, earthquake or nuclear meltdown, according to the state-run Liao Wang magazine. Much as I admire the example of an irrepressible human spirit at work in these creative designs there seems to be a lack of comprehension about what “the end of the world” means. If the world ends, how much will it help to be blown into space in a yellow steel ball? (2) Tom Cruise has made another sf movie, this time with Tron director Joseph Kosinksi. The first trailer for Oblivion is discussed by Grantland’s Mark Lisanti. Cruise’s spaceship is pretty cute. It looks like a couple of robot testicles bolted to a cross. Your child will want one of these, and you’ll feel weird about it. …Bedbugs have discovered a new way to hitchhike in and out of beds: library books. It turns out that tiny bedbugs and their eggs can hide in the spines of hardcover books. The bugs crawl out at night to feed, find a new home in a headboard, and soon readers are enjoying not only plot twists but post-bite welts. …To reassure skittish patrons like Mrs. McAdoo, libraries are training circulation staff members to look for carcasses and live insects…. Recently, 70 or so employees of the nine libraries in Wichita gathered for a “bedbug boot camp,” where Michele Vance, marketing director of Schendel Pest Services, showed them how to identify bedbug excrement, which resembles dots made by a black felt-tip pen. She also explained how quickly bedbugs multiply, and how they can live for months without biting humans. Unseen on camera footage, he is heard telling a Ren TV journalist he could not tell “how many of them are among us, because it may cause panic.” He said more details could be found in Barry Sonnenfeld’s “Men in Black” films. During his 2008-2012 presidency, Medvedev showed a sense of humor slightly more subtle than Putin’s sometimes brutal jokes. Now there is no denying that women were under-represented in the awards. Women are under-represented in all of comics and this is simply because comics, as a traditionally all-male field, is institutionally sexist. By extension, this means that many comic awards -including the BCA- are also sexist, as they are at the behest of a flawed system, and a byproduct of the industry being sexist. For example, let’s say the industry has a split of 70% male creators, 30% female. From this you have to select the best work to put up for nomination. Immediately, it’s highly likely that women are going to be poorly represented in nominations as there is a much smaller pool of work created by women to choose from. The Batmobile used in the 1960s Batman TV series is expected to go up for auction in January, the Barrett Jackson auto auction house said Thursday. The car could sell for millions, said Craig Jackson, chief executive of the auction firm. The Batmobile started life as the Ford Motor Co).’s 1955 Lincoln Futura concept car which, itself, was based on a Lincoln Mark II. Besides its pearl white paint job, the Futura actually looked very much like the Batmobile it would become over a decade later. George Barris also created the Landmaster for Damnation Alley. Unlike the Batmobile, it does not seem to have been in demand. I remember seeing the vehicle, gathering dust in a storage lot near Universal Studios, on my daily commute down the Hollywood Freeway. (7) A thought-controlled beer tap is available as a premium for donating $8,500 for the development of the Muse, a technology being developed with money from crowdfunding site Indiegogo. Garten said InteraXon has created a thought-controlled beer tap, which the company is offering to share with anyone who pledges $8,500 on the Indiegogo campaign. Beer starts to flow from the tap if someone stares at it long enough thinking only about the adult beverage. Remembering what happened to Louis Wu, I wonder if this is likely to be the equivalent of a droud for college freshmen. (8) Jonathan Strahan has announced the contents of The Best Science Fiction and Fantasy of the Year: Volume Seven, which will be published by Night Shade Books in March 2013. (9) ERBzine has posted Oberon Zell-Ravenheart’s story of the extensive research behind his magnificent map of Barsoom. I haven’t seen any map of Barsoom that really satisfies me, so I decided that I’d have to create one myself. In particular, the available ones seem to fall into two categories: two-hemisphere stereographic maps such as Burroughs himself drew up — none of which indicate any relationship with actual Martian features, either Victorian or modern; or Mercator projections which often attempt to match either modern NASA Mercator imagery, or Victorian-era drawings by Shiaparelli, Antoniadi, Lowell, etc. with all the “canals.” I really dislike the Mercator projection for such planet maps, as the distortion is extreme—especially in the polar latitudes. For my purposes, the Lambert Azimuthal Equal-Area projection is perfect. Burroughs, of course, had no access to our modern images of the red planet, so naturally his Barsoom was based on those delightful Victorian maps with all the “canals.” Burroughs even mentions these as “waterways” connecting the cities of Barsoom, and often references locations in reference to such features leading to certain cities, such as Helium and Zodanga. 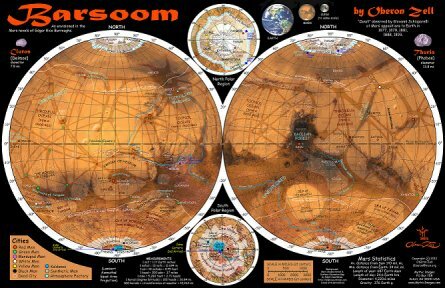 So any map of Barsoom has to be laid out against those Victorian-era maps, not against modern NASA photos. This is a place where most modern Barsoomian cartographers seem to have missed the point. His article shows again how a fanwriter’s vividly-written account of a subject he loves can interest readers in a topic they might not have cared about otherwise. Do you get the imression that Yang Zongfu probably got his notions about the end of the world from the movie, “2012?” Why else specify giant arks? While on the subject, did anyone else notice the implicit prejudices in 2012? The Earth is devestated, but somehow Africa is spared the worst of the volcanism, earthquakes, tsunamis and whatever else has rendered the Americas, Asia and Europe uninhabitable … Africa is *all ready* to be colonized by the surviving ultra-rich and planetary VIPs. Run that by again … it means Africa is empty. It strongly implies that all the unwanted Africans have been removed from the continent so that it can be refilled by rich businessmen, politicians and media personalities. What a waste. At least black Africans know how to work. I can’t imagine a world full of Donald Trumps and Ozzy Ozbournes surviving another year on their own. Well, let’s suppose Africa is not empty, then. It still has 200 or 300 million Africans in residence, many of them Muslims. Now imagine shiploads of mainly European descended and Asian colonists trying to wrest the best farmland form the current owners. Ought to be a violent and interesting next century. Tom Cruise in another lackluster SF film? Why do such limited actors always seem to want to be in SF films? In the Good Old Days they aspired to do Westerns, where there was little harm done. I don’t think that Barris’s Batmobile was the only one — there were two or three others made, later, that specialized in one thing or another — high speed drive-bys, for example… or doors that opened. Barris’s was the first though, and the only one converted from the actual Lincoln Futura concept car. I’ll have to dig up a photo to send you.